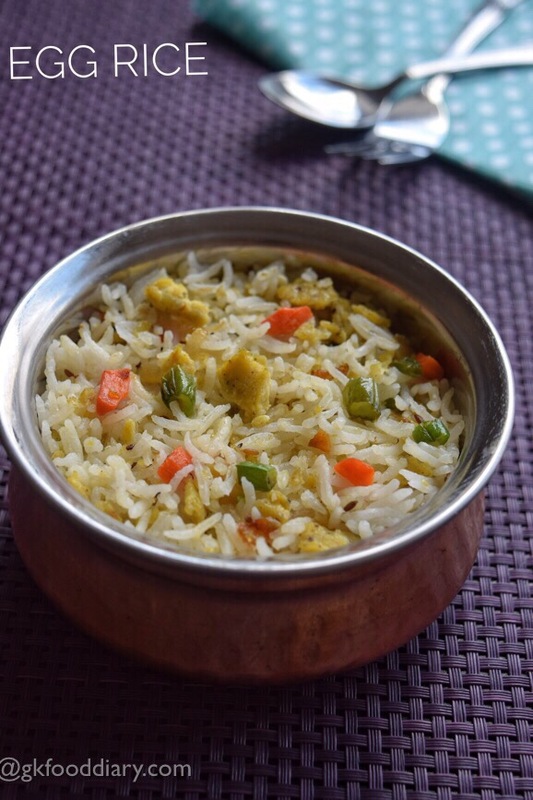 Egg rice – an one pot meal made with rice, eggs and vegetables. 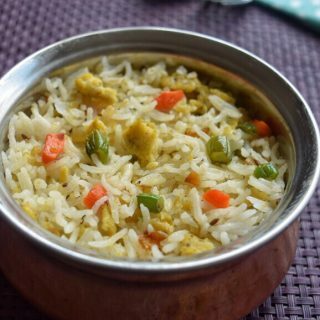 This egg rice is a wholesome and tasty dish for toddlers and kids which can be prepared within 15 to 20 minutes. 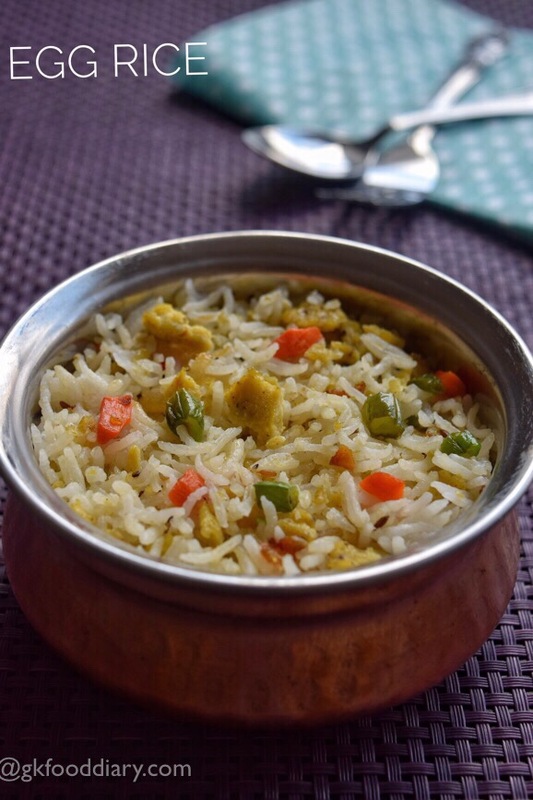 It is mildly spiced, but still good in taste, also you can load with any vegetables of your choice. Egg rice can be given to kids from one year. 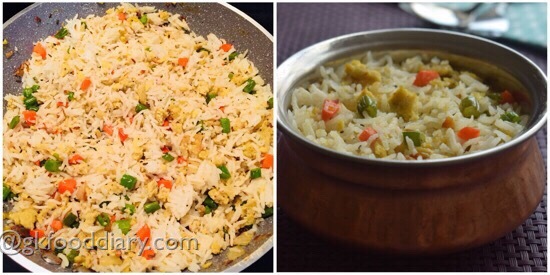 So what are you waiting for, Make egg rice at home and watch your kids empty their plates. Refer more rice varieties for toddlers and kids here. Now lets get on to check how to make egg rice recipe for toddlers and kids. Wash the rice twice and soak it in for 10 minutes. Then pressure cook it for 2-3 whistles with required water and a drop of oil in medium flame. The rice shouldn't be too mushy. Set aside. Chop, garlic, onion and vegetables finely. Keep aside. Crack and open the egg in a bowl. Add in little salt, pepper powder. Whisk everything together well. 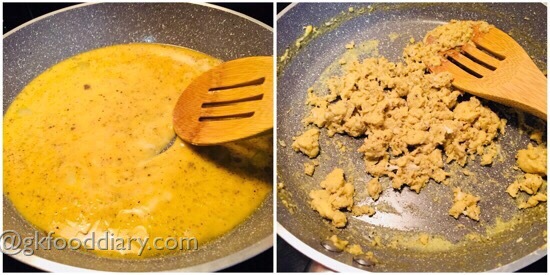 Heat a thick bottomed pan with oil and add in the whisked egg.Fry the eggs until they are cooked soft. Dont scramble them to dry. Once done, remove from the pan. In the same pan, heat ghee. Add in cumin seeds. Once cumin seeds Starts spluttering, add chopped garlic. Fry it until lightly brown. Now add onions. Saute them nicely until golden brown. Once the onions becomes brown, add the chopped vegetables along with salt.Saute on medium flame for 5 minutes until the vegetables are cooked. 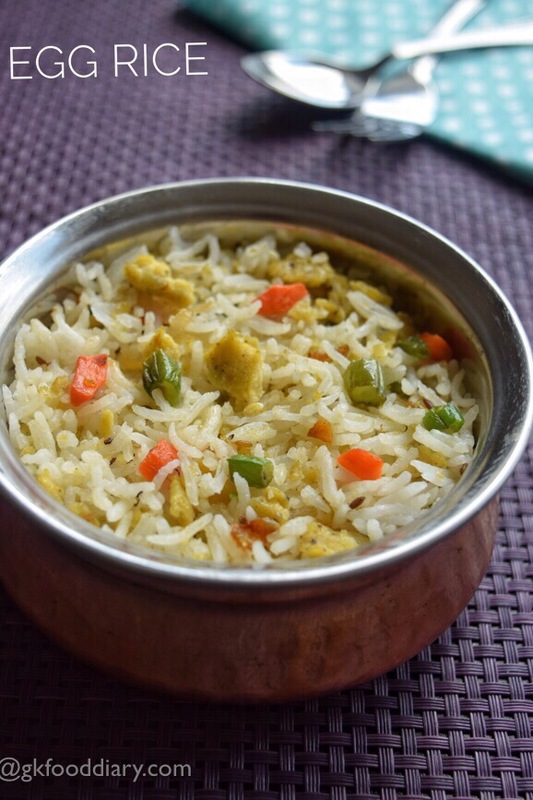 Once the vegetables are soft, add scrambled eggs, followed by cooked rice. Mix well and cook on a medium flame for 2 to 3 minutes, while stirring occasionally.Once done, switch off the flame and squeeze lemon juice, mix well and top with ghee if required. 1. 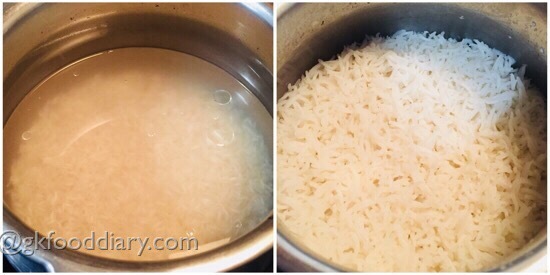 Wash the rice twice and soak it in for 10 minutes. Then pressure cook it with required water and a drop of oil for 2-3 whistles in medium flame. The rice shouldn’t be too mushy. Set aside. 2. Chop, garlic, onion and vegetables finely. Keep aside. Crack and open the egg in a bowl. Add in little salt, pepper powder. Whisk everything together well. 3. 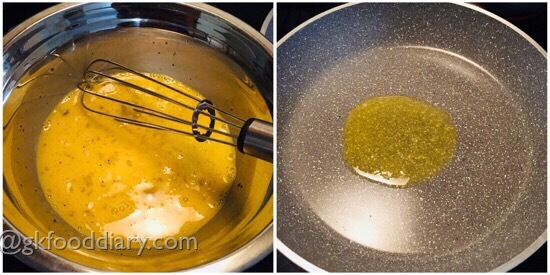 Heat a thick bottomed pan with oil and add in the whisked egg. 4. 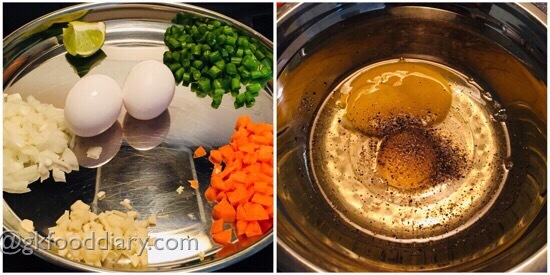 Fry the eggs until they are cooked soft. Dont scramble them to dry. Once done, remove from the pan. 5. In the same pan, heat ghee. Add in cumin seeds. 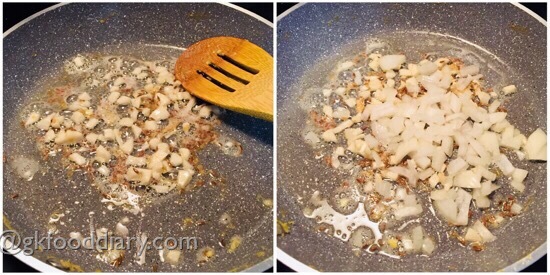 Once cumin seeds Starts spluttering, add chopped garlic. Fry it until lightly brown. Now add onions. Saute them nicely until golden brown. 6. 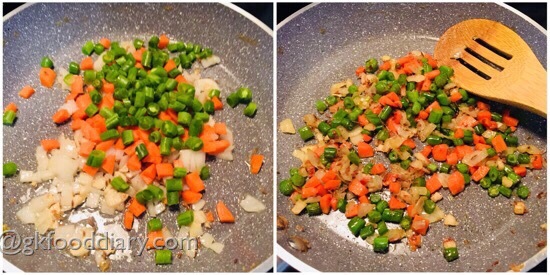 Add the chopped vegetables along with salt.Saute on medium flame for 5 minutes until the vegetables are cooked. 7. 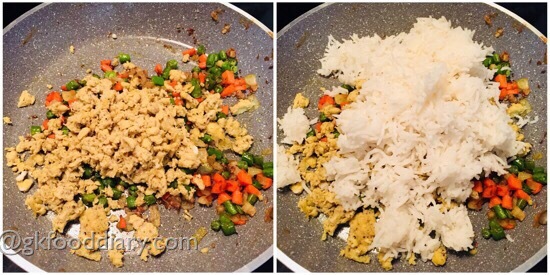 Once the vegetables are soft, add scrambled eggs, followed by cooked rice. 8. Mix well and cook on a medium flame for 2 to 3 minutes, while stirring occasionally.Once done, switch off the flame and squeeze lemon juice, mix well and top with ghee if required. 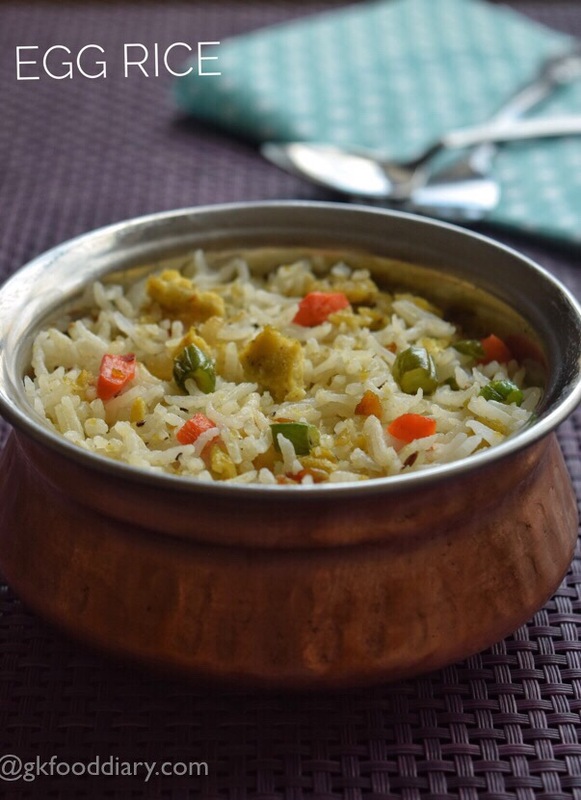 Serve the egg rice hot with tomato sauce or plain curd/yogurt! Dont cook the rice too mushy. Egg should be cooked well but dont make it too dry. Add green chillies while frying garlic if you prefer spiciness. 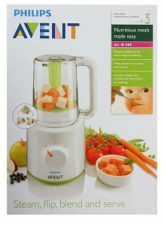 Green peas, sweet corn or potatoes can be added along with carrots/beans. Make sure to introduce eggs and vegetables separate before you try this egg rice for your toddler. Can we use this recipe without vegetables also?